Scopone - thanoscardgamess jimdo page! This game allows you to play the two popular versions of Scopone: the 9-card one and the 10-card (also known as Scopone Scientifico). Scopone is an Italian game - the principles are fairly simple but to play it well requires skill and a good memory. 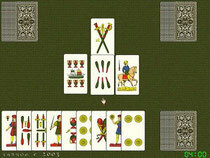 Scopone is closely related to the popular game Scopa, of which there are several varieties. It is played by four players, two against two in fixed partnerships; you sit opposite your partner. An Italian 40 card pack is used. The cards have point values for capturing, and a separate set of point values that are only used in scoring the "Prime". A turn consists of playing one card face up to the table, which may capture one or more table cards. In the event of a capture, both the played card and the captured card(s) are taken and stored face down in front of one of the members of the team that made the capture, like a trick. If there is no capture the played card remains face up on the table. In either case the turn then passes to the next player. In Scopone Scientifico all the cards are dealt to the players and there are no initial layout cards. You have the option to play with the Roman rules (2 variants), the Umbria and Marche, and the Naples rules of Scopone Scientifico.